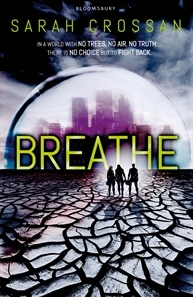 To me Breathe takes me back to great stories like Lake at the End of the World by Caroline MacDonald, Z for Zachariah by Robert C O’Brien and more recently The Forest of Hands and Teeth by Carrie Ryan. In this version of our future the vegetation has been destroyed to such an extent that humans can’t breathe in the open air. Everyone lives in pods, where the amount of oxygen you receive is restricted depending on your social standing. The very rich (premiums) have more oxygen, and so they can exercise, while those without the funds can’t, they can even be fined for walking too fast! There is a resistance group within the pod certain that the people behind Breathe (the company that supplies the oxygen) is sabotaging any attempts made to re-plant, so that there may be hope to live outside the pods in the future. The outward appearance is that they are attempting to grow trees within the pod, but further investigation shows that outside the pod, the new trees are being poisoned. As with many books with dystopian themes, the main characters form quite the unlikely team. Quinn is a Premium, son of a high powered Pod family, Bea is an Auxiliary and secretly in love with him, and then there’s Alina a member of the resistance. For Quinn and Bea what was supposed to be a camping trip to the Outlands, turns into journey to find out the truth. Alina needs a way out of the pod, and Quinn has the means to get her out. Instead of going their separate ways the three decide to travel together, Alina with a purpose, the other two unwilling to leave her on her own. On their journey they must evade soldiers, heat seeking planes, and while they try to avoid the notorious drifters, they end up bring one with them on their travels, Maude Blue who reveals more truths about Breathe. Of course things don’t go to plan, and the group is separated Maude Blue and the girls one way, and Quinn is left alone. Both groups are heading for the same place, the Stadium, a base for the resistance, a place where people are learning how to live in the Outlands. What they are doing is amazing and awe inspiring, so why does the POD want the stadium destroyed? It turns out that there is a book 2 coming out in 2013, so while some questions are answered, there's a number that will have to wait a year to be answered! This I so unlike the other Sarah Crossen book I read earlier this year Weight of Water, that I hardly believed it was the same author.